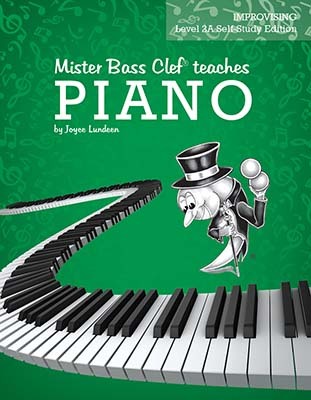 The Mister Bass Clef® teaches PIANO Improvising series will teach the student how to play from a fake book, by using chord symbols and improvising. A fake book is a collection of songs having only a single melody line of music along with chord symbols above the notes. It is called a fake book because the performer uses these chord symbols to make up, create, improvise or "fake" an accompaniment along with changes and additions to the melody. The performer can choose the style and level of difficulty. The arrangements for each song have been created to guide the student through the process of learning how to improvise. Each level adds new concepts while reinforcing those learned in previous levels. The summary at the end of each level includes the concepts learned in the current level along with those learned in the previous levels for easy reference and review. Upon completion of the entire Mister Bass Clef® teaches PIANO Improvising series, students will be able to create their own arrangements of songs from a fake book. Note: If you are working through these books without a teacher, you will need the Self-Study Editions which include the grand staff notation for each song and the review answers. Mister Bass Clef® teaches PIANO Improvising Level 1 can be started after completing the primer level of any method series. If starting this book without having completed a primer level, then study pages 4 through 9 before working on the first song. Mister Bass Clef® teaches PIANO Improvising Level 2A can be started after completing Mister Bass Clef® teaches PIANO Improvising Level 1. Mister Bass Clef® teaches PIANO Improvising Level 2B can be started after completing Mister Bass Clef® teaches PIANO Improvising Level 2A. Mister Bass Clef® teaches PIANO Improvising Level 3A can be started after completing Mister Bass Clef® teaches PIANO Improvising Level 2B. 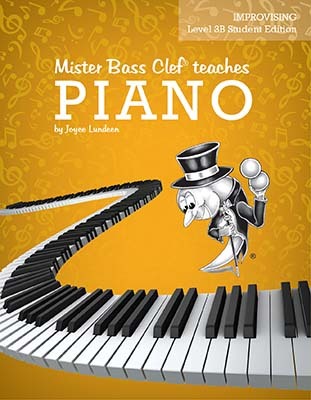 Mister Bass Clef® teaches PIANO Improvising Level 3B can be started after completing Mister Bass Clef® teaches PIANO Improvising Level 3A. The Teacher's Answer Key for Mister Bass Clef® teaches PIANO Improvising includes the grand staff notation pages of every song in Level 1 through Level 3B and the review answers for Level 1 through Level 2B. Note: The Answer Key does not include the instructions for each of the songs.